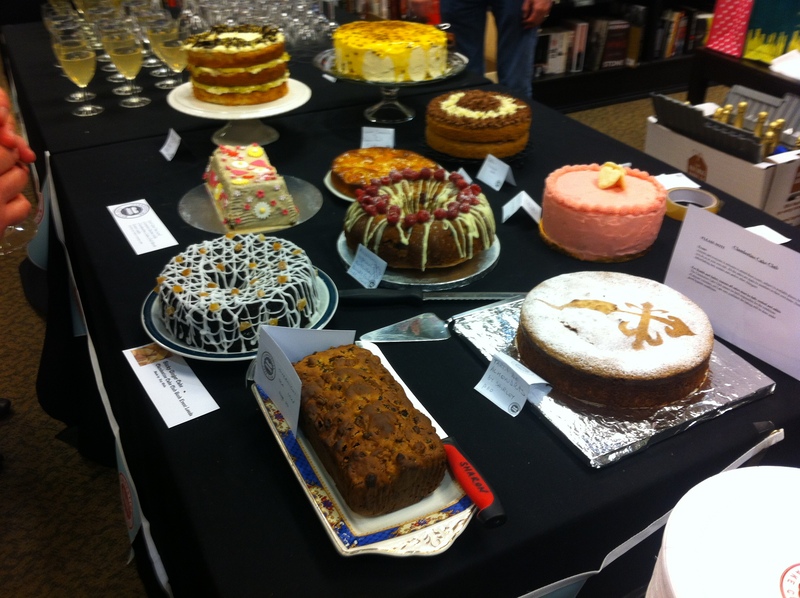 Last Tuesday only 5 days after the official publication of the Clandestine Cake Club Cookbook over 80 members and guests got together at the massive Waterstones on Albion Street in Leeds. 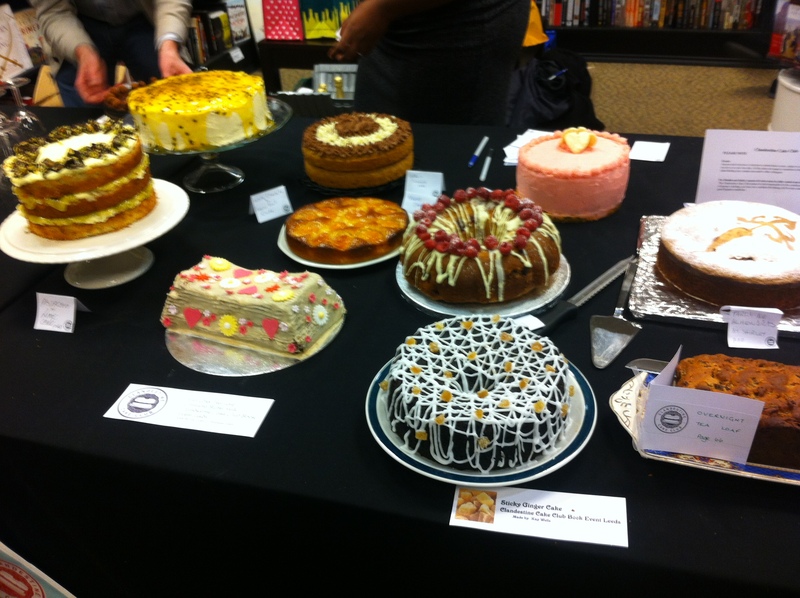 We were there to celebrate the book’s publication, meet and chat with Lynn Hill the Clandestine Cake Club founder and of course to eat cake! I had already got my copy of the book which arrived on the day of publication and I love it. I began to recognise lots of familiar names next to the recipes, some of the recipe creators were going to be there with their cakes on the night. As I joined the CCC after the recipes were submitted I had nothing to do with the book’s evolvement but I was just as excited to see it as lots of other CCC members had been talking about the book on Facebook and Twitter. 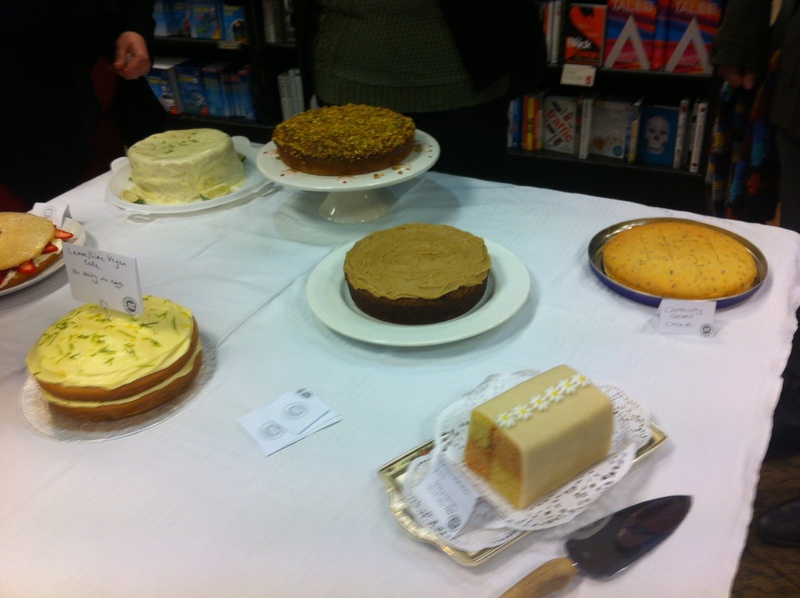 About 30 or so cakes were brought along to the launch. They were all recipes featured in the book but I had a job deciding which one to pick until I remembered I had always wanted to try one of Rachel McGrath’s famous bundts. I had heard a lot about Rachel , the organiser for Bolton CCC (aka Dollybakes) who regularly publishes eyecatching and delicious bundt cakes on her blog. Rachel has three bundt recipes in the book and I was keen to try baking the Raspberry Yoghurt Birthday Bundt for myself. 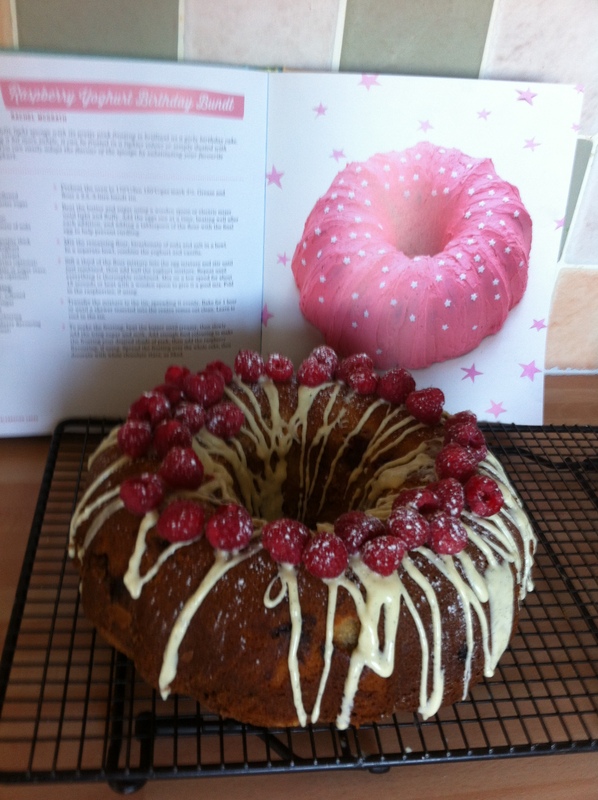 My version of Rachel McGrath’s stunning Raspberry Yoghurt Bundt cake with her original recipe pictured behind! I added the optional fresh raspberries to the bundt mixture, although I did not have enough due to my hubby nicking some to stick on his cereal that morning. He wasn’t to know, though, bless him! I also decided to add drizzled melted white chocolate and more fresh raspberries to the top of the cake instead. I do like the pink buttercream and the white chocolate stars on Rachel’s recipe though. 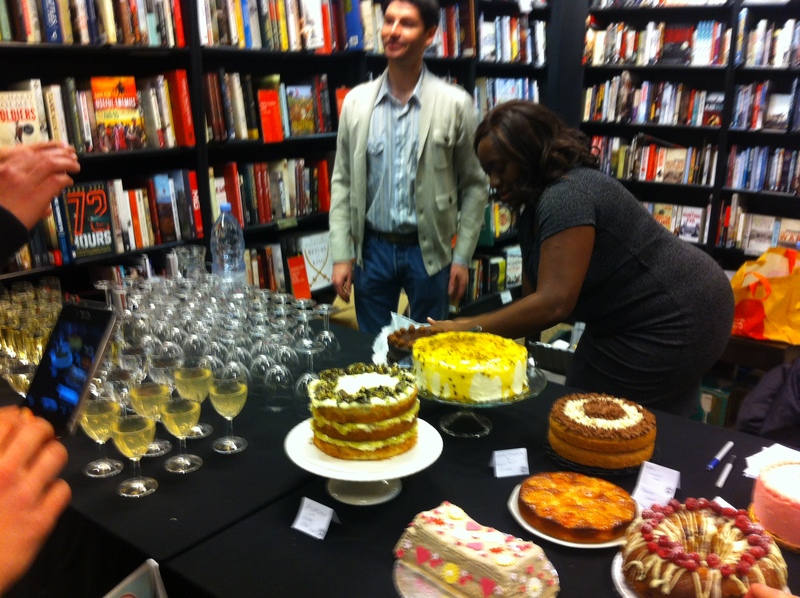 It was really exciting to go along to the book launch and to meet up with everyone. We all had some bubbly, elderflower cordial and water for the drivers and after Lynn’s talk we went for the cake. As I was told only that afternoon I had to watch my sugar intake and lose weight, I decided I would try two tiny slices of cake. We were also given a huge goody bag from Hobbycraft crammed full of crafty and baking items, what a lovely treat! After seeing the recipe in the book and being a huge Tiramisu lover I went for a slice of Helen Jones’ (aka Baking Aitch) Tia Maria and Mascapone Cake which is on page 121 in the book. It was gorgeous and I wished I could dive in and scoff the lot. The same went for the photogenic showstopper cake that adorns the front cover. Lynn Hill’s very own Pistachio and Lime Cake. Once again, my tastebuds were in for a treat but I forced myself to stop there. 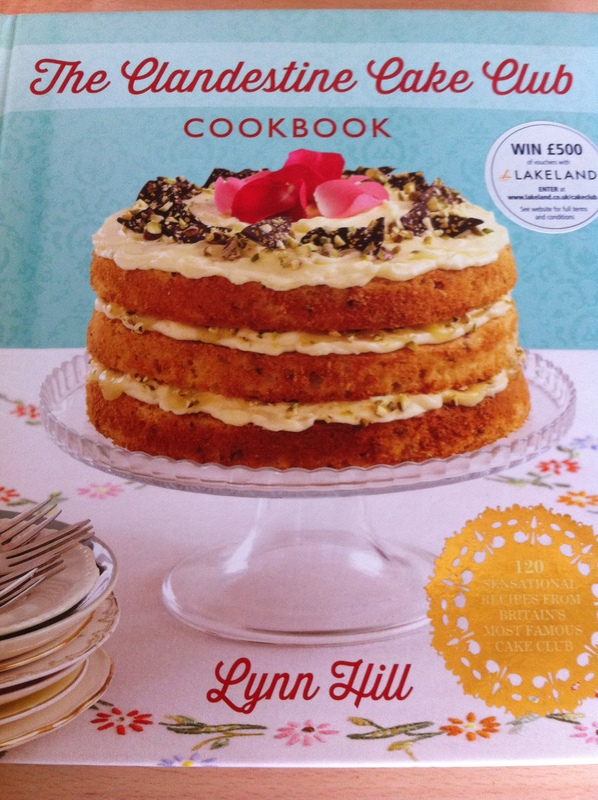 This is Lynn Hill’s Pistachio and Lime Cake as seen on the CCC Book’s front cover. It not only looks fab, it is fab! Everyone was completely bowled over by all the cakes and there was nothing left at the end of the night because as with a regular CCC event you always bring a plastic box to take home some treats! My kids wanted some of my cake but they were disappointed. Here are some of the photos I took on the night, unfortunately only having my phone with me a couple of the pictures were a bit blurred. They do show that we had a brilliant night though! Two huge tables laden with cake. Everyone brought their cakes along and there were drinks all around. They look too good to eat but they did get eaten! 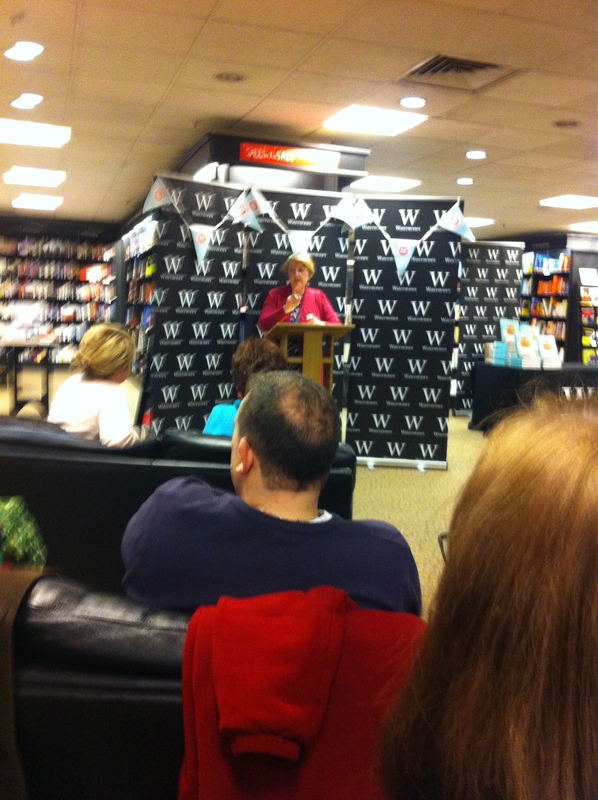 Lynn gave a speech before we sampled all the cakes. Ps. What is it with men and nicking food! I always save some berries for myself in the summer and before you know it they’re gone!